Easily accessible knowledge of employee time results in faster decision-making, improved scheduling and better labour cost management making organisations more productive and competitive. The importance of aligning all labour costs, with associated revenue and business profitability has never been more critical. 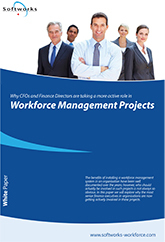 The recognition of the benefits that a WFM solution can bring to the efficiency of an organisation has prompted active involvement in projects, by the most senior finance executives in organisations today. This free paper explains the changing role of the CFO/Finance Director and how workforce management solutions can assist them as efficiency driver, strategic partner, forecaster and corporate governance expert.